In the late 1950s a young woman whose parents hoped she would enroll at Stanford (where her father taught civil engineering) instead had her sights set on Reed, a school that was the perfect fit for her list of requirements: a good academic reputation, small, coed, on the west coast (but not in L.A.), and free of fraternities and sororities. The launch of Sputnik had spurred a push in science education for women, and Virginia Oglesby, who liked science, enrolled in Reed as a chemistry major. She probably didn’t imagine that she would later contribute so profoundly to a different department altogether: Reed’s music department, from which she retired this spring. Her contributions to the college are numerous and extraordinary. For decades, she has served as student marshal at convocation and commencement, reading (and correctly pronouncing) the names of each and every graduate of Reed College. She has not only directed both Collegium Musicum and the Reed Chorus, she leads the Boar’s Head Ensemble at the annual alumni holiday party, and directed Gilbert & Sullivan events at Reunions. The number of committees she has served on is legion, including the presidential search committee in 2001. She was recognized with a Distinguished Service Award in 2011, and she helped to bring the Performing Arts Building into being. She has been the frequent chair and backbone of the music department, has guided many a student through rough patches in the thickets of music theory, led dozens of beloved classes in Bach, Brahms and opera; and she has introduced students to music that has stuck with them the rest of their lives, that they have pulled out years later to sing or listen to. A prominent Brahms scholar, Hancock has published important work on Brahms’s choral music and the influence of early music, and she has inspired students to become music scholars themselves. True to her science roots, she served as the fourth reader on many a chemistry student’s orals board. She has also (when we manage to get her a copy before we head to press) regularly and ruthlessly copyedited Reed magazine. 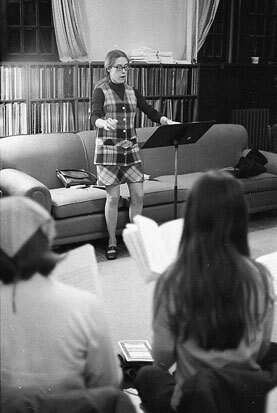 Hancock says there have been many great moments, memorable classes, and conversations, and that as a conductor, “every concert is a high point.” Because she is prone to turn her famously critical mind to performances she listens to later, she doesn’t revisit these recordings, preferring to savor the experience and the music in her memory. Whether she was conducting choirs, chemistry labs, or classes, the Reed community has been fortunate that long ago, it pulled Virginia Oglesby Hancock into its orbit.